TV`s. Pool Table, Ping Pong, Poker Table, Great Deck and much, much more. 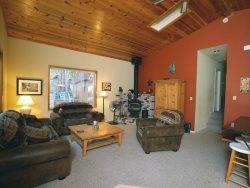 Hertogs Cabin - Located in the quiet area of Twain Harte, but still within walking distance of downtown, and encompassed by 2/3 acre lot among pine, spruce, and cedar. Extras Washer and dryer, blow dryer in both bathrooms, ironing board, iron and portable fans. We must have 24 hour notice prior to your arrival. After hours number is 209-770-1624. Remarks from our Guests Our fourth time staying here – we love it and all the new amenities to the house. Can’t thank you enough! See you next year! Such a big cabin with lots of stuff to do! We loved all the games! Pool, ping-pong, and monopoly were our favorites! Fantastic cabin! So well stocked. Love this speaker system and pool table! Fun! Fun! Fun! This is the third time we have stayed here, a fantastic place. We love it here! We love the cabin! So much to do, from pool to ping pong. We used it well and would love to return next year. Being close to town is wonderful! Another lovely summer at the Brown Bear Lodge! We loved hosting our family for pool and ping-pong tournaments. The new patio is awesome! The most fun cabin we’ve ever stayed! See you next year!